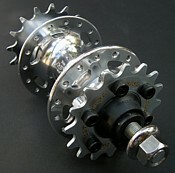 Complete M756 hub ready to use on any 110/120/126*/130*mm rear spaced track/road frame. Save on buying separate components and shipping costs. Pre-assembled ready to go. Simply add VeloSolo Disc Cog of your choice. Includes XT M756 hub assembled with our custom solid axle, CNC spacers and track nuts. 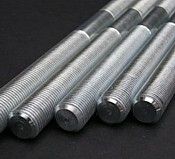 Also includes full set of 6 high spec M5 grade 12.9 hex bolts in 12mm length. Bearings are re-lubed with Finishline Teflon grease and precisely set. Can be assembled with 110, 120, 126* or 130mm* spacing and 41mm or 46mm chainline (46mm chainline allows a non-dished wheel build). *Note: 126/130mm hub options include cost of extra spacer kit. Much more on this in the FAQ and here: Use a Shimano hub?! Available in 32 or 36 spoke and in black or silver. Assembled to order (please note: non-returnable). As above but highly polished. Shimano logs become almost invisible. Hub is disassembled, anodizing is chemically removed and hub polished in three stages. Final hand finishing with wax based polish for a long lasting shine. Stock Shimano XT M756 front disc hub. Recommended hub for conversion to rear of track/road bike. 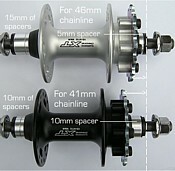 Standard hollow axled hub as supplied by Shimano ready for your own conversion as detailed on this site. Please see FAQ for set-up advice. Available in 32 silver option only (silver hubs are no longer manufactured by Shimano and no longer available in 36h but we have good stocks of 32h silver). QR lever not included. Perfect for a flip/flop fixed/free MTB or any 135mm spaced frame. Pre-assembled ready to go. Simply add VeloSolo bolt-on Disc Cog of your choice + singlespeed spacers + singlespeed cog if required. Can be used with gears, a normal cassette and disc brake when desired. Includes XT M756 rear hub assembled with our custom solid axle and track nuts. Also includes full set of M5 grade 12.9 hex bolts. Bearings are re-lubed with Finishline Teflon grease and precisely set. Assembled for minimum 135mm spacing only. Fixed side chainline will be 53mm to match typical singlespeed MTB or outer position of triple chainset. Much more on set-up here in the FAQ. Available in 32 or 36 spoke and in black or silver. Special order item (please note: non returnable). Note: DXR cog and singlespeed spacers not included. Pictures show polished hub, standard finish is anodized black or silver. Converts a Shimano M756 front disc hub for use on the rear of a track/road bike. Track nuts and spacers also required. Also ideal replacement for standard 10mm x 1mm fine threaded rear road or mountain bike axle or to change from a QR to solid bolted axle. Custom machined in the UK from EN19 high strength chro-moly steel. Bright silver passivated. Length specified slightly longer than normal to allow for track nuts with integrated washers. Choose 170mm for road/track (up to 126mm spacing) and 180mm for MTB (and road 130mm). Both M10 x 1mm fine threading. Please see FAQ for set-up advice. Use with solid axle above to convert 100mm spaced M756 front hub to 110/120mm for rear of track/road bike. Pack includes 1 x 10mm and 2 x 5mm to allow choice of spacing. Perfect for other spacing applications with any 10mm axle; swapping a 110mm hub onto a 120mm frame; 120mm to 130mm etc. CNC custom machined in the UK from solid 6082 aluminium alloy; not cut from tube. Superb quality. Precision milled to allow perfect fitting of original Shimano bearing seals giving a 'factory' finished look. Please see FAQ for set-up advice. To be used in addition to 110/120mm spacer kit to increase 120mm spaced front MTB hub to 126mm for rear of track/road bike. Pack includes 2 x 3mm. Neater alternative to our M10 stainless steel washers. Also ideal for other spacing applications with any 10mm axle as with the 130mm kit below, ie, fitting a 120mm track hub to a 126mm frame etc. To be used in addition to 110/120mm spacer kit to increase 120mm spaced front MTB hub to 130mm for rear of track/road bike. Or if you need a pair of machined spacers to convert a normal 120mm track hub to fit a 130mm frame this is the kit to use. Pack includes 2 x 5mm. Also ideal for other spacing applications with any 10mm axle. CNC custom machined in the UK from solid 6082 aluminium alloy; not cut from tube. Superb quality. Easy to fit to any hub with 10mm axle, simply remove outer bearing locknuts, add a 5mm spacer each side and re-tighten locknuts. Please see FAQ for set-up advice. Exact same spacers kits as above but now available in anodized red, gold and new black for corrosion resistance and because they look a little more special. Use for conversion of hubs or re-spacing hubs to 126mm, 130mm etc as above. Suitable for fitting to M10 solid axle to precisely adjust hub spacing as alternative to CNC spacers above or for spacing in 1mm increments. Pack of 6 M10 washers x 1mm thick. 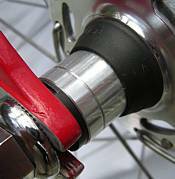 For example to fit a 120mm spaced hub into a 126mm spaced frame add three washers per side (between locknuts). A2 Stainless Steel for corrosion resistance. Please see FAQ for set-up advice. Pack of two high quality M10 track nuts with integrated rotating washers. To fit any solid M10 x 1mm threaded axle as above. Strong and secure. New size as above but in M9 now available to fit most front axles with an M9 x 1mm thread (most common track hubs including Formula, Zenith, etc). Made in the UK. Chrome finish.